What if todays Swedish Monarcs lived a life like the Kings of the past? 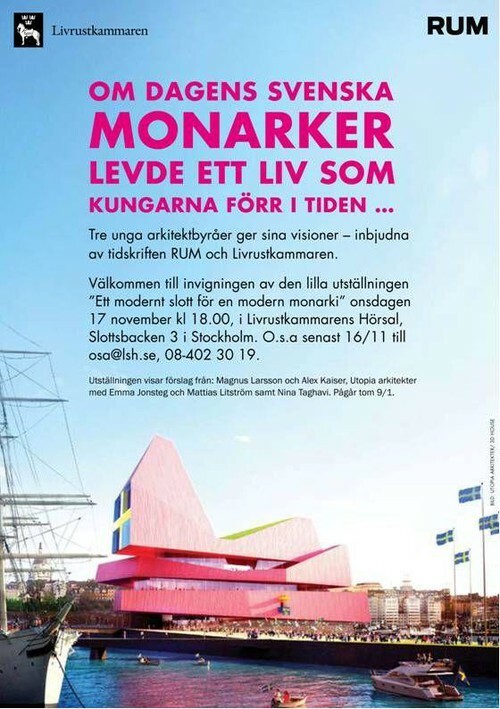 Three architects gives their visions in the exhibition named "Ett modernt slott för en modern monarki" (a modern Palace for a modern King). The exhibition is curated by the architect magazine Rum (Room). Participating Architects are: Magnus Larsson & Alex Kaiser, Emma Jonsteg &Mattias Liström at Utopia Arkitekter and Nina Taghavi.